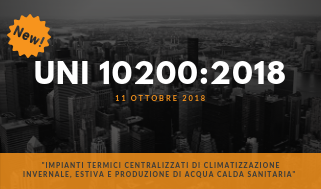 The new UNI 10200: 2018 entitled “Centralized heating systems for winter, summer and domestic hot water production – Criteria for the distribution of winter air conditioning, summer and production of domestic hot water” has become part of the national regulatory body October 11, 2018. The standard establishes the criteria for costs allocation of winter air conditioning (heating), summer air conditioning (cooling) and domestic hot water (DHW) in buildings with a centralized system, whether or not equipped with devices for accounting (vertical or horizontal) of the useful thermal energy, distinguishing the voluntary consumption of the single real estate units from all other consumption. The methods for costs allocation in proportion to the withdrawals actually recorded are defined, so as to encourage the rationalization of consumption and the containment of waste, while safeguarding the living comfort, and the criteria for costs allocation the so-called involuntary component, due to the dispersions of the facility. the introduction of assessment methods for the needs of the building and of the single housing unit and for distribution losses (Appendix D). EQUOBOX is the IoT solution of Sinapsi, ideal for accounting and for the allocation of operating costs in compliance with UNI 10200! EQUOBOX is the tool for Energy Managers, Condominium Administrators, Facility Managers, Utilities, able to account the energy and resources of a building. It is an extremely flexible tool able to support the user in various fields of application: from residential (in the presence of vertical or horizontal accounting), commercial and industrial. Its wide range of devices allows the accounting of different quantities coming from different sources: thermal and refrigeration energy, hot and cold sanitary water, electricity, gas, gray water, solid urban waste. Offering a guarantee of data, it shows a precise and detailed detail of user consumption information, making it aware and able to pursue energy efficiency. By optimizing and reducing consumption, the user is able to achieve significant economic and environmental savings.